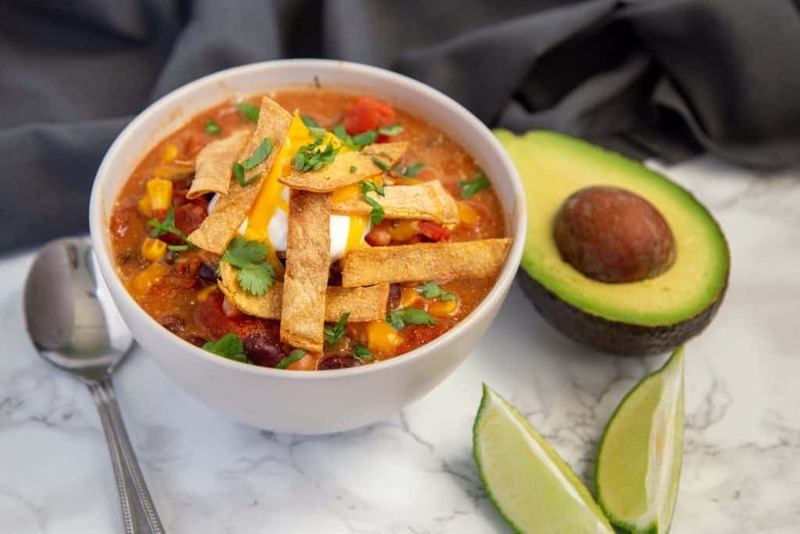 An easy recipe for Instant Pot tortilla soup: rich, hearty, and chunky soup filled with tomatoes, corn, beans in a flavorful broth. I clean out my pantry two or three times a year. My kitchen has really deep cupboards, so it’s easy for cans and other ingredients to get lost over time. During my pantry cleanups, I pull out all the cans from the back of the cupboards and try to use up everything that’s been sitting around for a while. This time I had lots of beans, diced tomatoes, and corn, so I decided to throw them all together for a super easy and delicious Instant Pot soup! My husband and I liked it so much the first time I made it, that I made the exact same soup a few days later. We ate it for eight days straight and I’m still craving more! An Instant Pot is a brand name of multi-use, programmable electric pressure cookers. The Instant Pot brand offers several different sizes and there are a number of other brands on the market as well with similar features. I have the Instant Pot Duo 6qt, so all of my instructions are based on that one. All of the pressure cookers brands and models are pretty similar; they just name things a bit differently, so refer to your manual if I reference a button that you don’t have on yours – or leave a comment in the notes and I’ll try to help you out! This recipe only has pantry ingredients – absolutely no chopping required. Just add cans of beans, corn, and vegetable broth to your Instant Pot stainless steel pot. Use whatever beans you have in your pantry – for me that was black beans and pinto beans. On top of that add diced tomatoes, a can of green chiles, and tomato paste. Then add some spices: cumin, chili powder, garlic powder, and salt. Seal the lid on your Instant Pot and close the steam release valve. Press the “Pressure Cooker” button until it’s on “Normal,” press the “Pressure Level” button until it’s on “High” and then press the +/- buttons until it says “00:05” (for 5 minutes). The Instant Pot will beep and say “On” while it’s coming up to pressure and then will beep again and start counting down. When the time is up, allow the pressure to naturally release for 5 minutes. This just means that you leave the Instant Pot alone and let it count up for 5 minutes. Then quick release the rest of the pressure by opening the steam release valve, making sure to stay clear of the steam. When the pressure is released and the float valve is down, carefully take off the lid and turn off the Instant Pot. Gently stir all of the ingredients together to combine. If using the sour cream and heavy cream to make a creamy soup, add them now. Serve with tortilla strips or tortilla chips, sour cream, cilantro, and/or avocado. Did you know that tortilla strips are super simple to make? You can do it while the soup is cooking. Just preheat the oven to 350 degrees F. Cut corn tortillas in half and then crosswise in thin strips. Place in a bowl or a large ziploc bag, add 1 tablespoon vegetable oil, and mix it up to evenly coat the strips. Place the tortilla strips on a baking sheet in a single layer, sprinkle with salt, and bake for 15 to 20 minutes until light brown and crisp. Looking for more Instant Pot recipes? 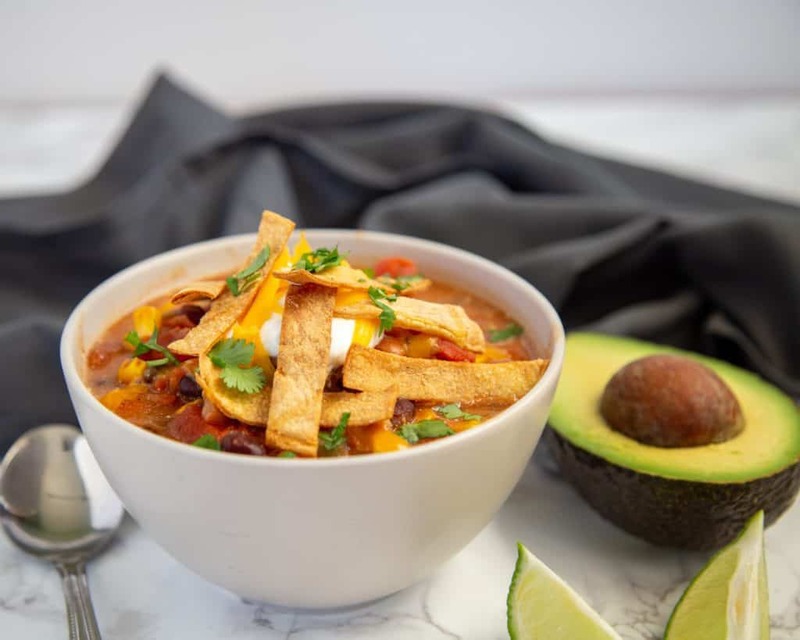 For similar, hearty flavors to this tortilla soup, try this Instant Pot Enchilada Rice. Craving more soup? Try this easy Instant Pot Mushroom Wild Rice Soup. 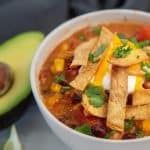 If you try this recipe for Instant Pot Tortilla Soup leave a comment and a review below and let me know how it turned out for you. Place the stainless steel pot in the Instant Pot. Add the beans, corn, and vegetable broth. Then pour in the diced tomatoes, green chiles, tomato paste, cumin, chili powder, garlic powder, and salt. Do not stir. Seal the lid and close the steam release valve. Press the “Pressure Cooker” button until it’s on “Normal,” press the “Pressure Level” button until it’s on “High” and then press the +/- buttons until it says “00:05” (for 5 minutes). The Instant Pot will say “On” while it’s coming up to pressure and then will start counting down. When the time is up, allow the pressure to naturally release for 5 minutes and then open the steam release valve to quick release the rest of the pressure. Turn off the Instant Pot. Stir all the ingredients together and add the sour cream and heavy cream, if using. Serve with tortilla strips or tortilla chips, sour cream, cilantro, or avocado. If you want to make your own tortilla strips, preheat the oven to 350 degrees F. Cut corn tortillas in half and then crosswise into thin strips. Place the strips in a bowl or a ziploc bag and toss with about a tablespoon of vegetable oil. Arrange them in a single layer on a baking sheet, sprinkle with salt, and bake for 15-20 minutes until crisp and lightly browned. 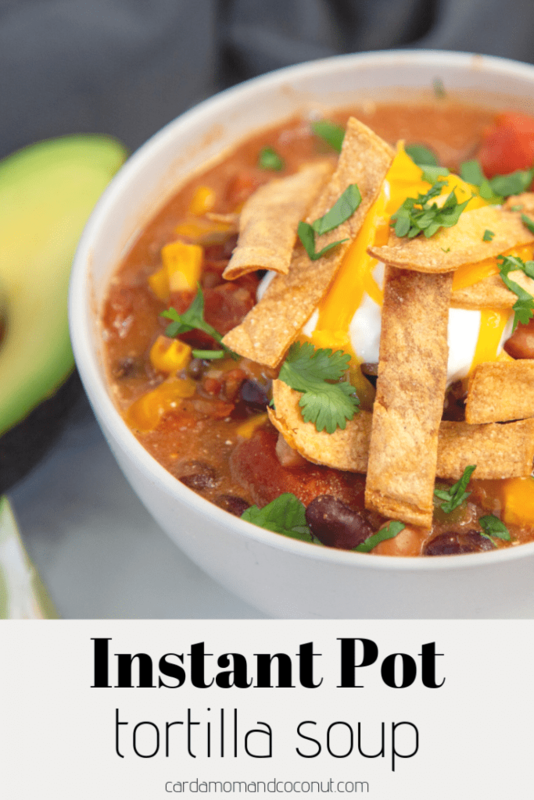 Love this instant pot recipe!! Well I don’t have an Instant Pot, but I do have a slow cooker and a stove-top pressure cooker. I know I can adapt this recipe to work in either of those. 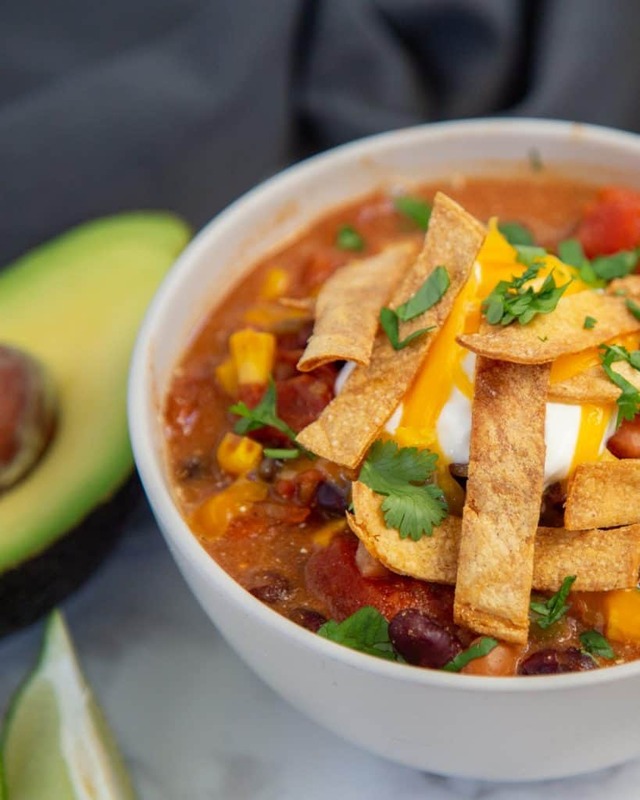 We love Mexican food, and this soup is the perfect meal for this cold winter days. Yum! There’s nothing like a good bowl of soup and this looks so delicious and flavorful! I’m definitely loving the added crunch of tortillas on top! Wow this looks yum! I need this in my life to beat this chilly weather! This is my kind of comfort food dinner! Looks so hearty and delicious! I can see this being on repeat here too! Tbis is the best kind of soup, using food from my cupboard. I need an Instapot so bad. This sounds like a really delicious and warming soup. Love that all the ingredients are mostly pantry staples! I haven’t had tortilla soup in AGES. Thanks for the reminder – this looks great. Love recipes for the insta pot, I know my family will love this one.